Free shipping! Pharmacokinetic and Pharmacodynamic Data Analysis: Concepts and Applications teaches everyday biological data analysis to the undergraduate and graduate levels. Through numerous examples and over 100 tutorials, scientists learn how to use PK/PD seamlessly in a variety of practical areas, from simple plasma kinetics, multi-compartment models, nonlinear kinetics, plasma protein binding, pharmacodynamic models, turnover concepts, receptor binding, functional adaption and rebound, dose-response-time data analysis, inter-species scaling and a lot more. Price includes worldwide shipping! Going beyond mere numerics and calculations, this textbook helps the reader to become life-long learners exceeding the confines of a course. They will find that with little more PK/PD concepts, their daily professional lives will be more productive, understandable and creative. 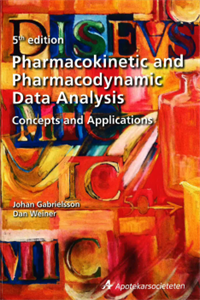 Quantitative Pharmacology – An Introduction to Integrative Pharmacokinetic-Pharmacodynamic... Organisk-kemisk nomenklatur, 3:e utg.